Jan. 26, 2014 – Rwanda and Yemen are among eight countries to have their General Assembly voting rights suspended over non-payment of dues. Rwanda completed a two-year stint on the Security Council on Dec. 31, 2014. It is the fifth biggest troop contributor to UN peacekeeping operations. Minimum payments of $69,948 from Yemen and $7,636 from Rwanda are required to get their voting privileges back, according to a letter from Ban Ki-moon to the president of the General Assembly. Liberia is also listed in Ban’s letter but he has sinceinformed the GA that Monrovia has made the necessary payment. 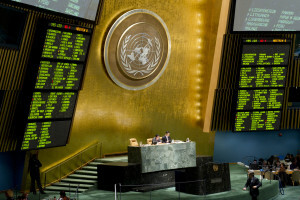 Macedonia is also among the countries currently without a General Assembly vote. It will have to make a minimum payment of $24,606. In total, 12 countries are not in compliance with Article 19, but four of those, including Guinea-Bissau and Somalia, can still vote as the GA decided that inability to pay is beyond their control. Rwanda has been assessed dues of $54, 271 for 2015 while Yemen’s dues are $271,357 for the year. Next NTA GISIBYA IMYIGARAGAMBYO Y’IMPURUZA YO KUWA 29 MUTARAMA 2015 IZABA.